Fire Protection: Large openings (50% open area for common rack sizes) allow sprinkler water through to lower levels. 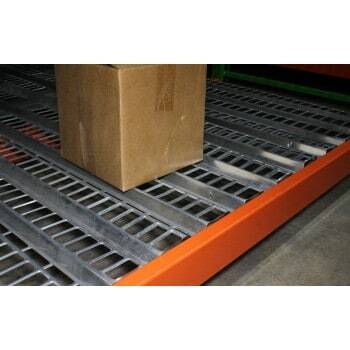 Product Friendly: Smooth top surface reduces product hang-ups that can cause damage. Ergonomically Designed: Hand stacked boxes slide on and off easily without catching. No Waterfall Edge: Punch Deck is flush with the top of the step beam allowing for easy labeling and bar coding on the face of the beam. UPD3836-42D Used Punch Decking 42" x 36"
UPD3830-42D Used Punch Decking 42" X 30"
UPD4430-48D Used Punch Decking 48" x 30"
UPD9230-96D Used Punch Decking 96" x 30"
UPD9236-96D Used Punch Decking 96" x 36"
Used Punch Decking has been added to your Quote.